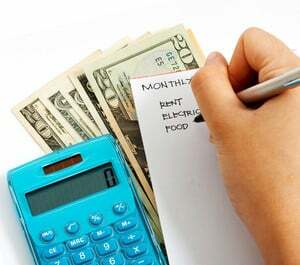 Build your budget and regain control of your budget, money and finances. Recently I realized that I was backsliding into old, dangerous financial habits that were hurting my budget, money, finances. I needed to regain control of my financial situation. Unfortunately, I receive a fixed income that is pretty low. Also, I live in an area that is not exactly the cheapest in the United States. So a carefully created budget is a must. Now I know there are a lot of people who consider a budget to be constraining. I like to have a budget, though. It tells me what amount I can spend without guilt or fear. You see, I help support my family. If I overspend, they suffer. Having savings to cover my “indiscretions” helps us all. Life gets really intense until I’m back on the straight and narrow. I want to have my head above water and my budget in hand. My last problem occurred in April of this year, when I found out that I had transposed a couple of numbers on my quarterly estimated taxes for last year. The government requires me to send in these taxes every three months throughout the year, so any mistake is multiplied by four times of sending in the wrong amount. Ouch. That was bad enough, but I also had no savings to speak of because of some unexpected expenses — that would be expenses I had not put in my budget because I forgot about them! Therefore I was late paying the amount I had underpaid on my taxes. The government required me to pay interest on the late taxes and threatened me with fines. It took some solid effort to get everything caught up and now I am rebuilding my savings account to avoid future problems of this type. I’m also rebuilding my budget so I don’t have forgotten bills showing up again. First, I logged into my bank’s website. I pulled up the account I use for paying bills, as well as, well, everything else. I checked to see how far back their records of my account were available. Thankfully, it was for longer than a year. Although it took a LOT of printer paper and ink, I printed out the entire year’s records. If you need to start from scratch with collecting records of spending, set up a large manila envelope. Mark it with the current month and year. Then from the first day to the last day of the month, place all receipts and other spending records in the envelope. If you don’t get a receipt for an expenditure, just make a quick note on a piece of paper of what was spent and where and drop it in the envelope. 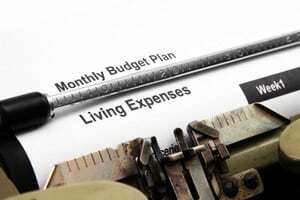 At the end of the month, start a budget, using the accounts and amounts for the previous month. Then start a new envelope on the first of each month, until you have another month’s worth of records. At the end of each month, incorporate any new accounts and numbers into the budget. Continue to do this until you have a complete record of all spending and income. Next, I took a yellow legal tablet and started listing each entry under a financial heading that made sense to me. So, the first entry was for my house payment. I started a page with ‘Mortgage’ written at the top and wrote the date, the amount and the name of the mortgage payment on that page. I used headings such as Mortgage, Phone, Electricity, Gas, Water and Sewage, Trash Pickup, Automobile Maintenance, Fuel, Automobile Insurance, Food and Household Goods, Personal Needs, Clothing, Entertainment, Church Offerings, Pets, and Savings. There were no headings for any kind of debt, because no one in their right mind would offer me credit right now! However, if I had had any credit, I would have gone back over all of my credit statements over the last year for all expenditures also. Then I would have entered all of the expenditures under the appropriate heading. It’s important that you have a thorough list of where your money comes from and where you spend it. If you can’t remember exactly what each expenditure at your local extremely large discount store included, make your best guess. If need be, divide the amount among the various categories that might be included (i.e., Clothing, Household and Clothing or Pets and Entertainment). Remember to take note of bills that are due more often than monthly (weekly book club dues?) and those that are due less often than monthly (quarterly estimated taxes? Biannual car insurance?). 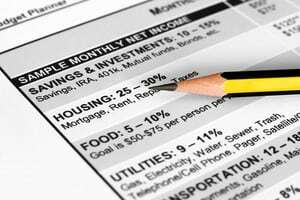 These will be entered into your budgeting calendar differently than the normal monthly bills. Also, if you have a small business or side hustle, make sure to set up separate accounts, budgets and records for the business. 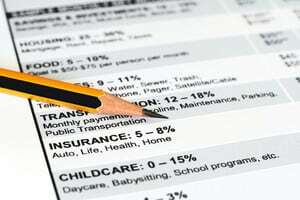 The Internal Revenue Service prefers that you not mix personal and business records. And I mean, “prefers” to the point of considering it to be the sign of a possible fake business used only to avoid paying required taxes. Once you have your spending for a good lengthy period (six months or a year, preferably) listed, and all spending is laid out in lists according to Categories (Mortgage, Phone, Electric, etc. ), then it is time to make note of any expenditures that repeat on a regular basis. For example, you will usually pay your mortgage each month. Beside the word “Mortgage” at the top of the page, write the word “Monthly”, assuming that is true. Make a similar note for each Category. For example, the trash pickup company bills me every quarter (every three months or four times a year). Thus, on my Trash Pickup page, I wrote the word “Quarterly”. Once you have categorized each expenditure, take the time to look over every page you’re written. Consider the possibility of either completely eliminating, or lowering, each item, one by one. When I did this, some expenditures were an easy elimination. For example, the last time I personally turned on the television was September 11, 2001. I do not watch television at all. When I quit watching television, Hill Street Blues was the new big show. So when my marriage ended, it was an easy decision to discontinue any form of cable television. At the time we were paying over seventy dollars a month for cable, just in case somebody wanted to watch something, which that someone usually didn’t bother with. The fact is, my income dropped from a low six figure amount to a low five figure amount and it isn’t likely to rise much. I’m no longer young and jobs that I can do are not so plentiful as they used to be. So trimming the budget was a definite must. Whether it’s a must or a nicety for you, now is the time to check it out. I’ve got to tell you, eating out is a MAJOR money muncher. Be strong: cook at home more and eat out less. You’ll be both healthier and better off financially. It’s a great boost to the budget. Also, consider doing things like calling your insurance agent’s office to discuss whether your coverage is up to date and if there are things you’re paying for that you may not want. I once discovered that my home insurance covered a large amount of jewelry. Even my wedding ring (before the ex took it back) was only worth about eighty dollars maximum. Almost all of my jewelry came from street vendors or craft booths. Certainly not a high dollar category for me, ever. Look carefully at any payments that are automatically withdrawn from your account, for the same reasons. It’s easy to start a monthly subscription for a service and then forget about it. That’s an unnecessary money leak, if you never use the service again. Take the time necessary to plug those little money leaks. This helps improve your financial health. The next thing I do is to take this list and rewrite all monthly bills onto a Master Monthly Bill List in order of the due dates. First, I label columns as Date, Bill (name), Amount, Due Date, Date Paid, Payment Method and Comments. I then rearrange all the other bills in order of due date. I list the bills that need to be paid quarterly on each of those four due dates. If it is due twice a year, I list it on each of the two dates it is due this year. Once I have these two lists, I’m ready to start using them to remember to pay all of my bills. At the beginning of next month, for example, I take a piece of paper and write in the column labels I listed above. Next, I go through the Master Monthly Bill List and list all bills due on the first. After I finish with that list, I go to the Other Master Bill List. There, I write in all bills that are due in the first week of that particular month. I then repeat for the second week of the month, the third, and so forth throughout the month. Remember to check the Other Master Bill List as well as the Master Monthly Bill List for each week. The last thing I do to make this more useful for me is to mark the dates of the month that I expect to receive income. This helps me to see what I need to plan to pay with each check. Sometimes, if a check can cover another bill or two, I go ahead and pay those bills ahead. I’m trying to move ahead each month. Eventually I’ll have money for the bills ahead of having the bills! A bit of extra padding can be very useful in the event of an emergency. This also allows me to smooth out my cash flow. I don’t end up with $12.00 for groceries one paycheck and $200.00 for groceries on the next payday when I do this. There Is More to Budget Than Just Bills! This is just a way to get a handle on your bills each month. In order to truly get control of your money, you’ll need to plan spending on other things. This would include groceries, fun stuff, transportation, and so on. We will catch up on that stuff later. Meanwhile, I hope this method of making a Monthly Bill Budget gives you a boost in handling your expenses responsibly. I have used this method successfully for years, and I believe it may be helpful to you, too. Give it a try and let me know what I can do to improve it!